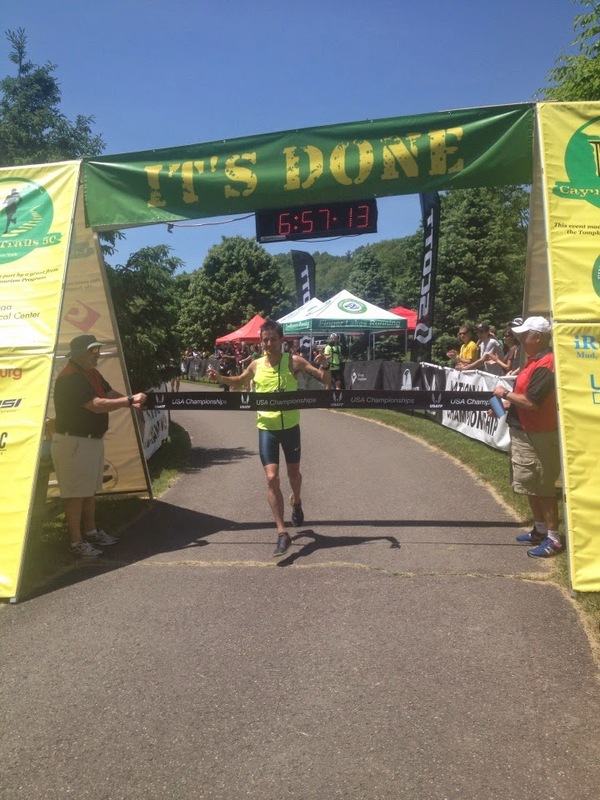 I want to begin by saying that this will not be your ordinary race recap post. This will be a discussion about how far the sport has come, the building interest in the East, and the potential for the sport in the future. My personal story begins 4-weeks prior when I twisted my ankle on a training run on a Thursday. It was nothing special just a stupid mistake as I approached the entrance to some trails. The ankle continued to get worse and for the Tom B Trail Run, I was a little on the weak-side with the ankle so I knew that I had to be cautious. I used the race as a training run and succeeded running 3-sub hour laps until the final lap. I hit a root and with already a marathon in my legs, I faltered and twisted the chocolate sauce out of the thing. I then continued to walk and kinda jog the last 8 miles. I finished in 4:15 crawling at sub 10 minute pace. The next week was taken entirely off in hopes to heal my really severe medial ankle sprain which is about 5% of all ankle sprains and I am a pronator which means that I favor that side of my ankle. Luckily I had trained some big volume days leading up to the event and by 3 weeks time, would be feeling the gains. By the week of the race, I was back to running my 10-13 mile runs around the same pace I normally would without too much struggle. I came into race weekend confident I could place well but knowing I had to run more conservative than I would like to because of my weakened ankle where I felt one false slip and I would have done permanent damage that would sideline my running for months on end. 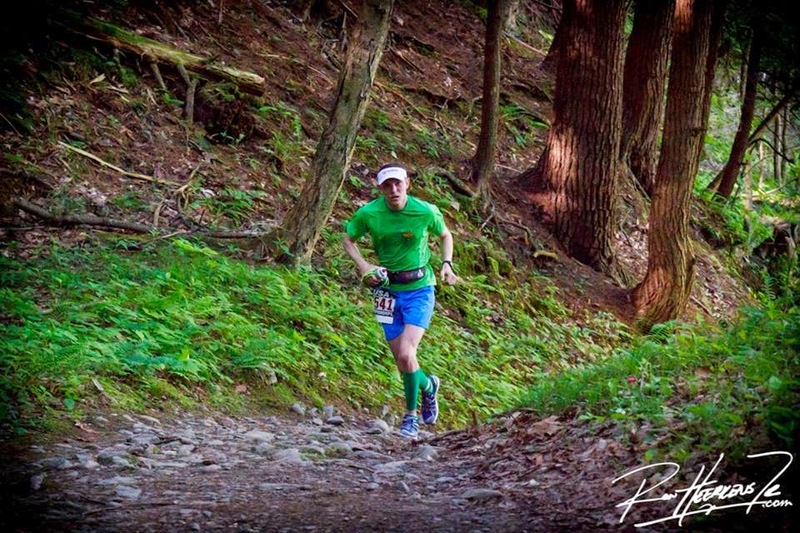 Ian Golden has done such a great job with the Cayuga trails and I have been lucky enough to have him for a boss at the Finger Lakes Running Company. It is always great to see all the praise that everyone has given Ian, the volunteers and race management, sponsors for the race. This year had some amazing competition and I was excited to finally have my name in the mix. I knew that I was not at full 100% but was still expecting a strong race with the solid training I have been able to put together. Matt Flaherty-50 mile road champ extrodinare and a speedy guy to boot. 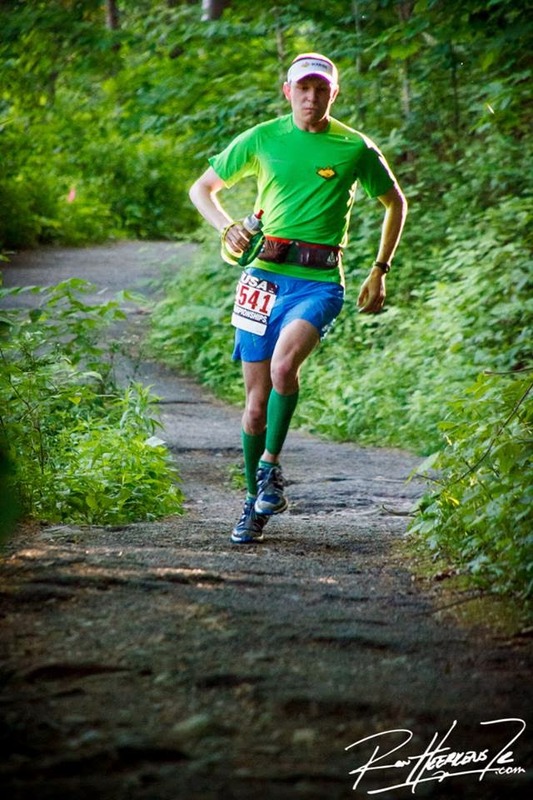 Chris Vargo- Perhaps the most legendary mustache in ultra running history and part of the Nike Trail Team. The guy runs ridiculous times out west in Cali and Colorado. Surprise... Tristin Williams---- who smacked me at USA Mountain Running last year. Yassine- who is a 100-mile specialist and Western States Top 10 finisher. 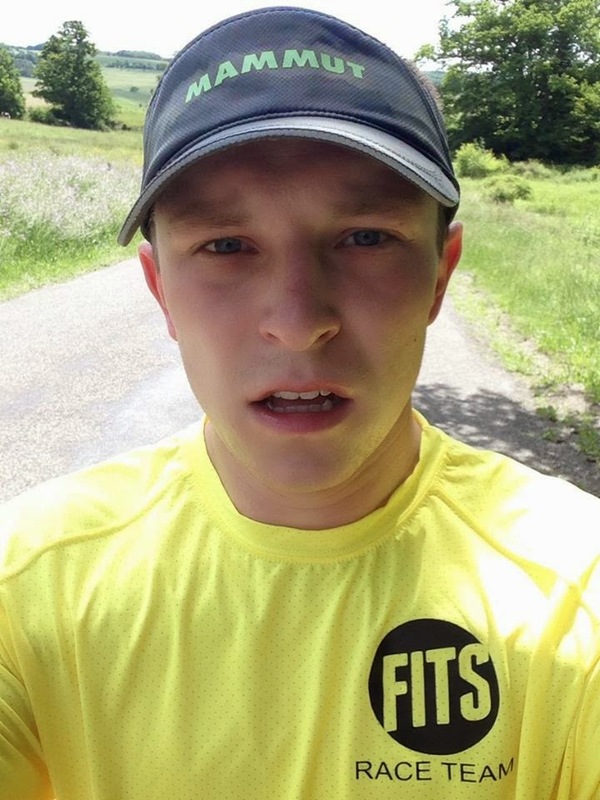 Ben Nephew- the East Coast FTK specialist of the Catskills who is arguably the fastest runner on some of the ickiest terrain. 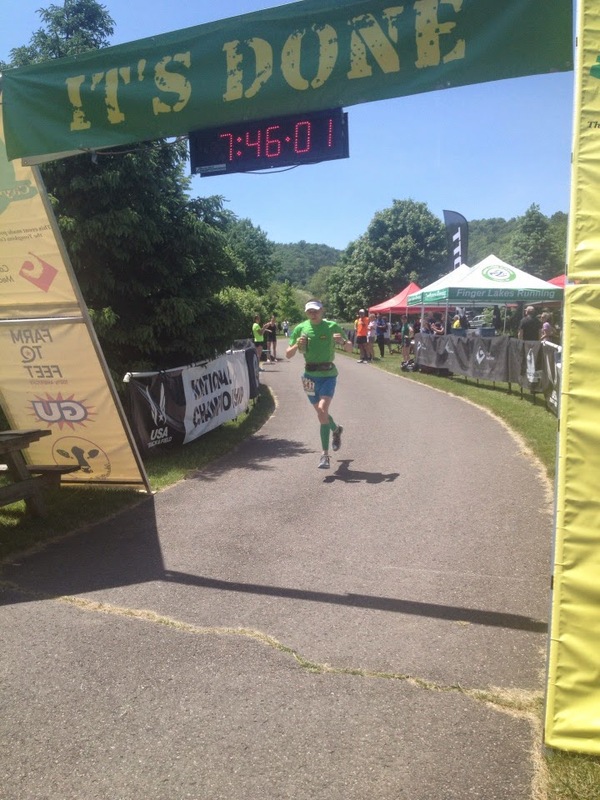 Brian Rusecki- who now runs for Patagonia and has run crazy times at Vermont 50, races in Virginia, a solid performer. 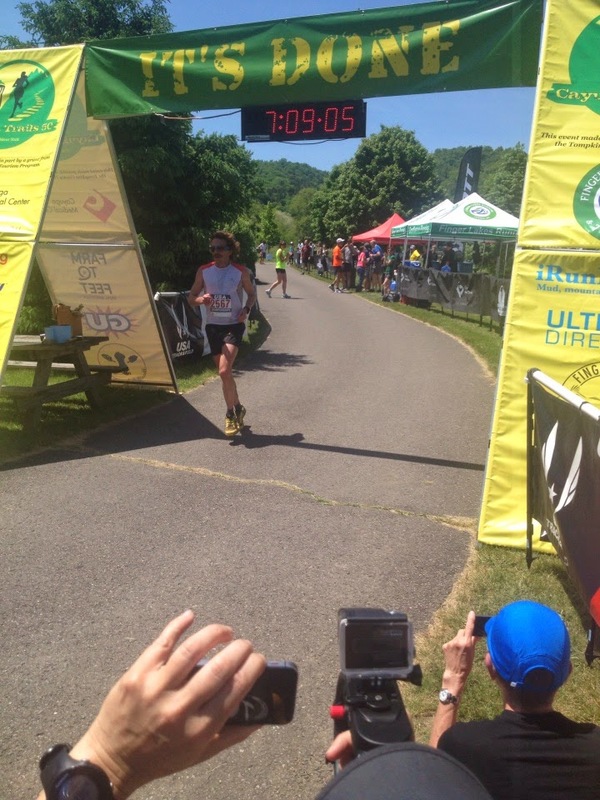 Jordan McDougal- North Face Bear Mountain Multiple winner and super fast and top three last year. As you can see the race was stacked. A top 10 finish would be lovely and a top 5 or 3 would be ideal. Back to the story… So I arrive with my father at the race, check in, say HI to Joe Viger, Ryan Welts, Amy Rusecki, Kristina Folcik, and many others. It was a cool morning and I could feel the pre-race jitters. I hit up the bathroom as usual and hung around nice and relaxed ready to run 50 grueling miles. I had a Clif Bar for breakfast and some pre-race Honey Stinger Cherry Cola Energy Chews, yum. 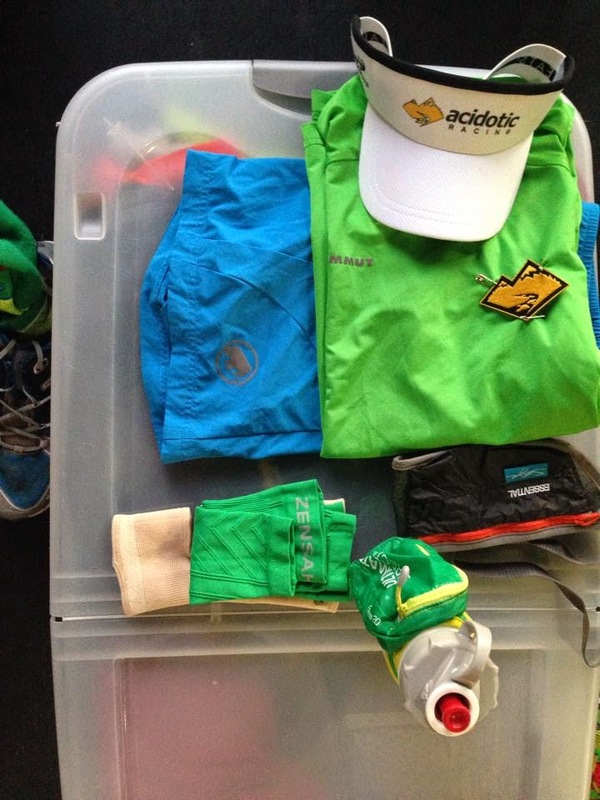 I had all my Mammut gear ready with my MTR 201 Pro Lows in the new icicle blue and my blue and green gear. I had my new Coolmax Fits Socks that are blended with Merino (SOOOO AMAZING) EVERYONE MUST BUY THIS FALL, and my Acidotic Racing Visor and little logo on my shirt! With 10 minutes, I lined-up with the top crew and was ready to roll. Never before have I felt like people know WHO I AM. I had people I have never met before wishing me luck, who have read my blog and have talked about my recent accolades. It feels surreal because I do not approach myself like a celebrity but for anyone that has supported me and looks up to me THANK YOU! Your support and admiration is a breath of fresh air. I have been blessed to have such wonderful support and anyone that considers themselves a fan of myself... Thank you. I will state here that IF I Ever Were to become famous, I will always remain humble and respectful of everyone that is awesome and cares about me. My goal in all of this is to inspire people that hard work pays off. That your dreams can become a reality if you wake up each and every day ready to fight for them. I spent my life being told I was never good enough for anything and here I am today. I am still on the cusp of big success but I attribute what I have achieved to believing and having people that have believed in me has given me the strength to keep on when I felt like calling it quits. Thank you again. Once the rams horn went off we were out. I settled into the pack of top guys. We are like 15 deep as I can feel the excitement of a USA 50 mile trail championship. I know that many of the guys upfront will lose pace so remaining consistent would be the goal. I decided to remain mid-pack as I had no idea how the ankle would hold and the pace was hot from the get-go so I wanted to remain smart. I also knew that the weather would heat up later in the day so running a smart and consistent race would pay dividends in the later stages. I settled along with Ben Nephew, Yassine, and some other fast dudes as we meandered around the gorges. I began to run the uphills with ease so I knew all my vertical was paying off leading up to the race. With my ankle, I strained on the downhills but that was to be expected. The course was of course gorgeous and more importantly was the first race in a long time for the East Coast to bring this deep of competition to an ultra marathon. I have never run 12 miles into a race and still have a pack of guys to run with. I enjoyed the day with the race and up the steep Lick Brook Climb gained some ground on Yassine and company. At this point, it was the large main pack that I had to catch but the race was still early and I wanted to take it easy to ensure a stronger second half. Once we left Buttermilk and then headed on the fields that connect into the last section of the Gorge Trail, Yassine caught me. I was having the beginnings of fatigue and could feel myself losing pace 4 miles before this photo op. Photo Credits to Ron Heerkins Jr.
We ran together for numerous miles as Yassine would crush the downhills and I would catch back up on the Uphill sections. It was fun to be back running with him again. I was following my gel and liquid nutrition plan getting ginger ale and water at the stations, downing at least a gel ever 45 mins and consuming 20 oz every aid station. I felt good. Then Ben Nephew caught up to us a few miles from the turn around and we hit the Lucifier's Steps and I could not climb with them. My legs felt real tight from stressing the downhill sections and holding my body back and the heat of the day was starting to deplete my body quicker than what I could take down. I was beginning to become severely dehydrated. I lost my edge and then the separation began. Once I lost ground on Yassine and Ben, I knew that I had to be smart. My ankle began throbbing and I had the thoughts of dropping. I hit a low point only 3 miles from the 25 mile turn-around. I walked up some of the hills and felt like I was trotting. I remember seeing all the top guys maybe a mile ahead of me and knew that if I could make due and improve my pace something could come of this but I felt exhausted. Ron Heerkins Jr with another solid photo! As I came to the turn-around I saw that Jordan McDougal had dropped out and I talked to him about how he felt. He mentioned to me that the top guys were looking strained and that if I held it together, I could get into some of the carnage. I too was struggling now from the heat and beginning to feel its effects but I thought if I was in 8th now, I could pick up some spots and if guys are to drop then I would have a chance. I came out of the aid station like person reborn. I won the coveted CLIMBER's JERSEY for the fastest section from the turn-around to the next aid station which has some solid climbs and Lucifer Step's again. I was still climbing like a champ and went for it. Once I got back into nearing Lick Brook, a Salomon Runner was with me now. 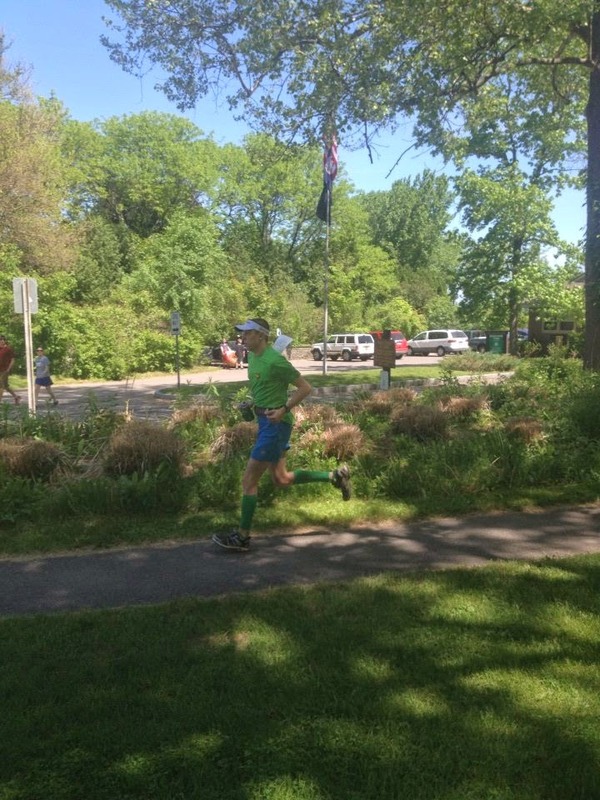 It was hard to fight with this guy as physically by mile 30+, I felt hot! I would be able to cool myself off at the creek crossings and aid stations, but truly, all the water and GU Brew that I could take down just was not enough to get myself back to feeling comfortable. I was able to pass him near entering the downhill to Buttermilk Falls. I came down to the Falls, and Ian mentioned that I looked like I had stopped sweating. I was cold and clammy and had no visible sweat on me. That was bad. No wonder I felt like I was roasting on this 80 degree day. I cooled off and kept powering through. The race from this point with 13 miles to go was not good for me at all. I managed my body from going from Heat Exhaustion to Heat Stroke the last 13 by cooling myself off but I felt dizzy, cold, tired, my legs were cramped, I had a headache. It was not comfortable. Myself and Kristina Folcik-Welts experienced much of the same issues as did many of the competitors. Each aid station, I was told runners were dropping like flies and I kept hearing places opening up for myself as people were moving up slots because of the drops. 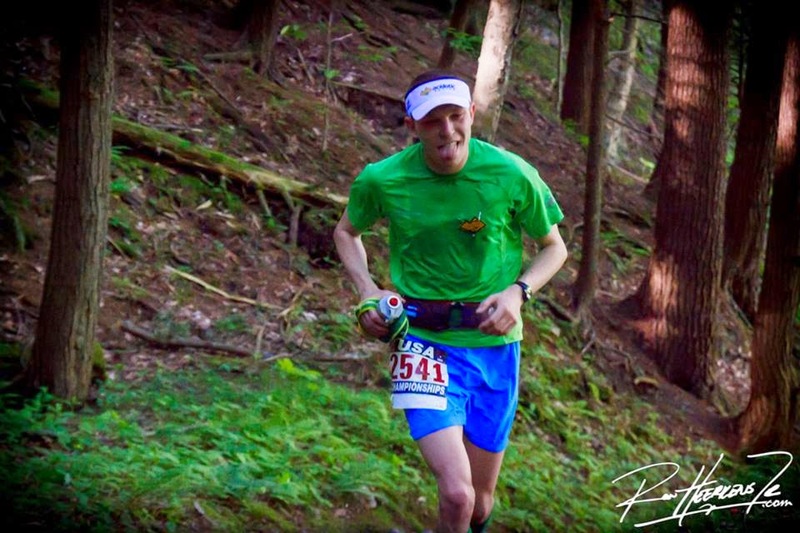 With the vertical and the toughness of the course, I dug deep and pushed through. 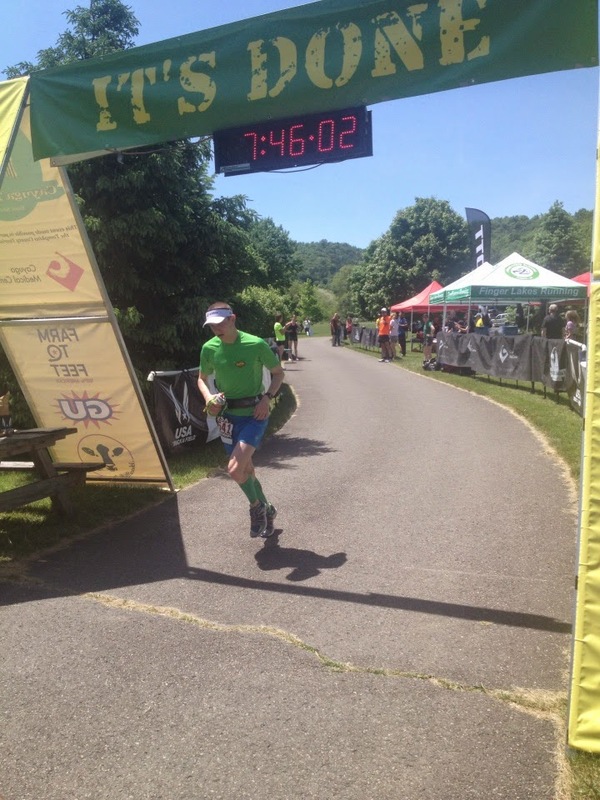 Once I hit the last two aid stations with 7 miles to go, my body was spent. I was walking more of the hills now if not all of them and of course could hardly even run the uphills. I just wanted to be done. What ultras teach you is to dig deep even when you are having a crappy day, because you never know what the day can bring. For Cayuga, I felt like my race was not good at all but was not terrible. I have trained hard since November and Snowshoe Running Season has given me a new level of fitness that I am very happy about. If my ankle was at 100%, I feel my performance would have been much different but that is what racing is all about: seeing what you have on the day. I held things together and finished 7:46 which was much quicker than my 8 hour time last year on a harder course with both ankle issues again. 7th in a much deeper field from 9th I will take it as I struggled but the story of the day was to just hang on and hope the heat would not kill you. I was pleased with a solid day of hurt and struggling but it taught me to hang tough and good things can happen. My summers I like to train hard to prepare for a fast fall. This Fall, I would like to run more of the Road Ultras as my Can-Lake 50 race was no fluke and I love that I have a real knack for the roads. I also thing as my ankle continues to heal and strengthen, running on the roads might not be a bad idea. Luckily in Cortland, I have plenty of tough ascents on road and gravel seasonal roads so I can achieve a lot of solid vertical up and down without stepping on the rocky and rooty trails. 3rd Place--Matt Flaherty who had a tough day and hung in there. I DID IT!!! SO HAPPY TO BE DONE! With a Cold Winter, Heat acclimatization was crucial for success. 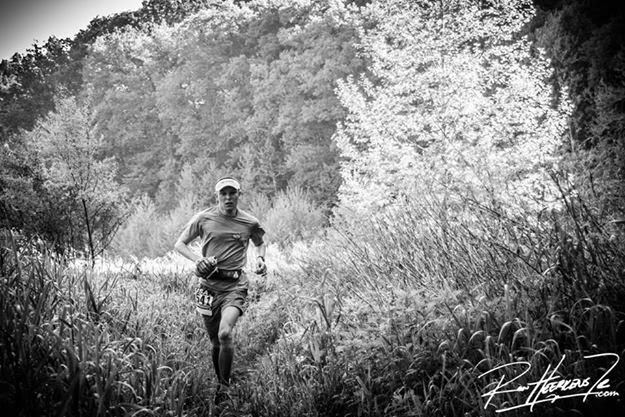 The amount of interest in Trail Running and Ultra Marathoning has exploded in the East! This is a very exciting time as more and more top athletes are coming from the East rather than Colorado and the West. There are more and more races featuring prize money and I was amazed with how solid the competition was this year. I cannot even wait for JFK! I feel that my running is coming around and I look forward to getting myself out there more to market the companies that keep me going. I have an awesome bunch of sponsors and they deserve more media time and I hope I can get them there. 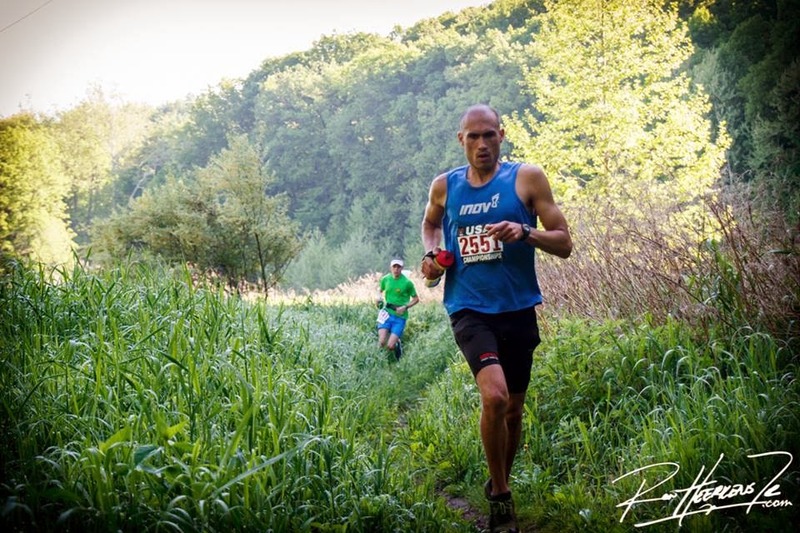 More and more athletes are being sponsored which is great in the sport of trail and ultra running and people are really taking a liking to the sport. I am very pleased with the excitement that is being generated from the sport and cannot wait for Cayuga Trails 2015! We all learned from a tough day but it was a great day! Thank you to my family, friends, people that want to support me, my sponsors: Mammut North America, Fits Socks for the most amazing new Cool-max socks, Acidotic Racing, Redfeather Snowshoes, Karhu/Craft and Confluence Running for the support. Thank you Ron Heerkins JR for the photos and Matt Gawors for the photos too. Thank you everyone and have a wonderful summer! Mammut MTR 201 Pro Low in Icicle Blue! 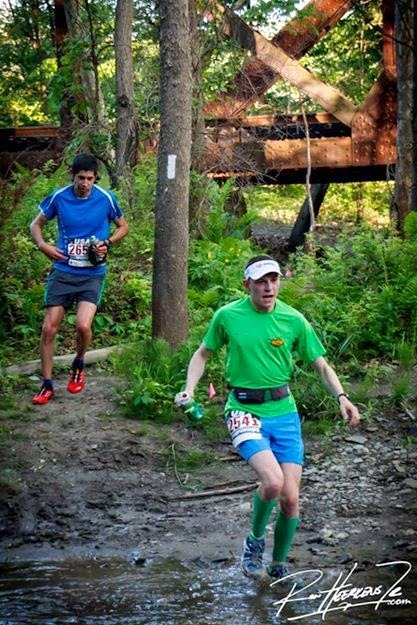 Next up is Manitous Revenge which is a crazy Catskill mountain race. I look forward to having fun and testing myself. Have a great summer and see everyone next year! 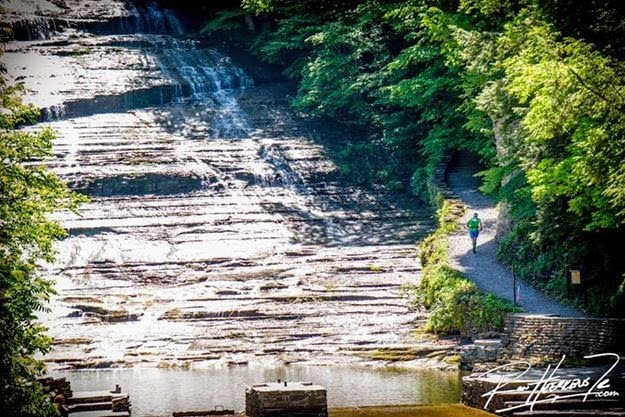 This race is BURLY and not being much of a mountaineer, I have no idea how my climbing skills will be but at least it will be a fun experience and I can say I summited a bunch of high peaks in the Catskills.